It is said that March comes in like a lion and out like a lamb. We started the month by marching into Lancaster with snow. By the end of March, the flowers will all be blooming and the weather will be perfect for evenings in the swing. But, what to do in the meantime? Well, it’s Lancaster County and there is no shortage of fun things to do, some free, some not. Starting March 1 – the snow geese are back at Middle Creek. Take a camera and tripod and capture some amazing photos. Dress warm, because the wind can really blow through here! There are also some lovely paths to hike (literally marching into Lancaster) while trying to find the best view of the snow geese. Spend a day at Longwood Gardens. The meadows are lovely and filled with hiking paths for your enjoyment. But, the orchids in the conservatory will knock your socks off! March 4 – 10th – it’s Restaurant week in downtown Lancaster. Now before you get worried about going into the ‘big city,’ know that downtown is 11 miles from Carriage Corner and Restaurant Week is the best time to check out an interesting restaurant for a fixed price. March 15 – 17 Annie Bailey’s Irish Public House Straight from Annie’s website: Everyone’s favorite holiday is upon us! And if celebrating at Downtown Lancaster’s favorite authentic Irish pub isn’t alluring enough, then perhaps an ENTIRE WEEKEND filled with loads of live music, Irish dancing, festive food, delicious drink & hanging on the deck (weather permitting!) will all help to sway you in the right direction… Sláinte! March 9 – Haven’t seen Jesus yet? Well the show is back until October 5, this is one you don’t want to miss. Click to read our review. Also, note that we can get discounted tickets for you – because everyone wants to save a little money! March 16 – Nana Does Vegas at Rainbow Comedy Playhouse – as all shows at Rainbow are, this one looks to be funny! All month long, American Music Theater is having great concerts. March 4 – also starts Yarn Camp at Lancaster Yarn Shop. Check out Craft March for more information. March 27 is the start of the AQS Show in Lancaster. So, now that you know all the fun things there are to do, why not pick your favorite room? I did a live tour of Log Cabin and Lancaster Rose on facebook – check it out and then call to make your reservation! Have you been to Longwood Gardens yet? Located less than 30 miles from Carriage Corner, Longwood Gardens and Kennett Square offer three opportunities to enjoy a festive Saturday spent shopping, dining and strolling. 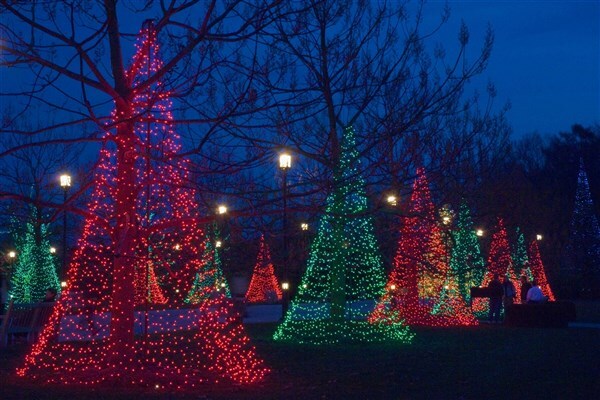 On these Saturdays: November 24th, December 1st and December 8th, there will be a shuttle between Kennett Square and Longwood Gardens. Head on down to Kennett Square and wander around the streets of this charming town. Maybe grab a bite to eat before catching a shuttle to Longwood Gardens. You will need a ticket and we’re happy to help you purchase them. Just give us a call at 717-768-3059 and let us know you are interested when you make your room reservation. Longwood Gardens is a botanical garden. It consists of over 1,077 acres of gardens, woodlands, and meadows in Kennett Square, Pennsylvania in Brandywine Valley. Longwood’s story is one of legacy, innovation, and stewardship. The gardens are a living expression of all that the founder, Pierre S. du Pont, found inspiring, meaningful, and beautiful. From the intricate fountain systems to the meticulous gardens to the architectural grandeur, awe-inspiring discoveries await at every turn. 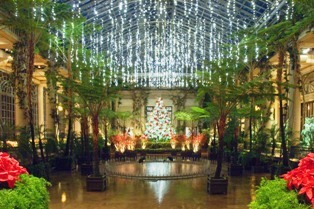 A Christmas fantasy awaits guests to Longwood Gardens from late November through early January each year. This holiday season, Longwood Gardens pays homage to the Christmas tree with an imaginative display featuring traditional favorites and inspiring new twists. Dazzling floral displays, festive firs suspensed from above, towering tannenbaums created from books, stained glass and other unexpected materials, holiday music, 500,000 outdoor lights, dancing fountains and ice skating under the stars are just a few of the highlights of the popular Longwood Gardens Christmas. The 4.5-acre heated Conservatory is filled with thousands of poinsettias accented with amaryllis, narcissus, begonias, cyclamen, and tulips flourish. Elegantly decorated trees shimmer elegantly decorated trees shimmer and sparkle with festive flair. In Longwood’s Exhibition Hall, dazzling icicles fashioned from lights hang from the vaulted glass ceiling, creating a frosty ambiance for the stunning poinsettia tree gracing the Exhibition Hall Stage. Outdoors you will find gloriously illuminated trees that will lead you on an enchanting holiday journey through the Gardens. Sip cocoa and warm up by three strategically placed and welcoming firepits, listen to carolers sharing the melodic sounds of the season, and relish in the beauty and wonder of A Longwood Christmas. As you stroll through the grounds, you can marvel at the more than 500,000 outdoor lights which illuminate trees in classical and free form styles. The fountains dance day and night to holiday music beneath glimmering starry snowflakes. The wildlife trees are decorated with edible ornaments for Longwood’s feathered and furry friends. Once you have wandered all around Longwood Gardens, you have several options of where to enjoy a meal: 1906 which offers a fine dining experience (reservations required), the Cafe which serves fresh and seasonal cuisine or the Beer Garden where you can enjoy tasty pub fare and Victory Brewing Company beers on tap. After an enjoyable day of shopping in Kennett Square and taking in all the holiday sights and sounds at Longwood Gardens, return to the comfort of Carriage Corner. We’re happy to light the fire in the guest lounge, slip off your shoes and relax with a freshly baked cookie or two and a cup of cocoa. Check out Lancaster Rose and make your reservation soon! There’s only a few holiday weekends. By Gaylen / Carriage Corner, Food, What To Do / Comments Off on It’s Harvest Time! Fresh is Best – and it doesn’t get any fresher than this! Fresh produce is abundant in Lancaster County. If you drove out here, now’s your chance to load the car with beautiful fresh produce to take back home! Since moving to Lancaster County, we’ve learned: the best prices are off the beaten path. So, with that in mind – let’s take a little trip to some fabulous farm stands. Driving Tour of Lancaster County Farm Stands. When you leave Carriage Corner, head straight down the Old Philadelphia Pike to Kauffman’s Fruit Farm & Market. Purchase a half bushel bag and fill it from the ‘seconds’ apple bins out front. Growing in Kauffman’s orchards are varieties of apples I’ve never heard of. We use a mixture of them in the applesauce we serve during breakfast. Kauffman’s is a one of a kind shopping adventure that you’ll want to experience for yourself. Old Homestead Farm is a 60 acre farm that grows a wide variety of fruits and vegetables which is sold not only at their farmstand, but they also are at several farmer’s markets and offer a CSA box. They also have pick your own strawberries, but you’ll have to come back in the Spring for those. The farmstand is located at 361 Hartman Bridge Road Ronks, PA 17572. They are open year round from 8a – 5p Monday through Saturday. Lapp’s Farm Market is the next stop on our small tour of Lancaster County Farm Stands. The Market opens each year around May 1, eager to share springtime harvests of onions, asparagus, lettuce, and lots of delicious strawberries. Each Market season ends with winter wreaths, swags, fresh cut Christmas trees, and an assortment of festive holiday decorations. Lapp’s Farm Market is stop #3 on our tour and is located at 1406 Lampeter Road, Lancaster. You can shop Lapp’s Farm Stand Monday – Saturday until 5:30p. Next up on our tour of lovely, local produce is King’s Fresh Produce. King’s is located in Leola and this is what their website has to say: In the early spring, King’s opens their growing season with homegrown asparagus, onions, and juicy on-location “hothouse” tomatoes. Stop by throughout the summer and feed your family well with plenty of field-to-table varieties that are picked fresh daily including sweet corn, string beans, cantaloupes, watermelon, and much more. The fall season always brings an abundant harvest of colorful mums, pumpkins, and autumn gourds. King’s is open until 6p Monday through Friday and they close at 4 on Saturdays. Hammond School Farm Market is our next stop. The Hammond School Farm Market is located at 611 Ranck Road, New Holland 17557 and it’s open from 8a to 8p Monday through Saturday. Take advantage and do a little shopping at the end of the day when things have cooled down a bit and lots of other places are closed. Beiler’s Fruit Farm is located on 897 in the foothills of Welsh Mountain. A beautiful drive this time of the year. Beiler’s is probably my favorite place to stop and get fruit and veg and apple cider. From the beginning of apple harvest season through as late as April, stop by Beiler’s Fruit Farm for their freshly pressed, non-pasteurized apple cider. Beiler’s is open year round, weekdays until 6p and Saturdays until 5. So, pick your favorite room, (mine varies between Log Cabin and Lonestar) book a get away and follow our map to check out these beautiful farm stands as well as other interesting placing to visit in Lancaster County. We are looking forward to meeting you!